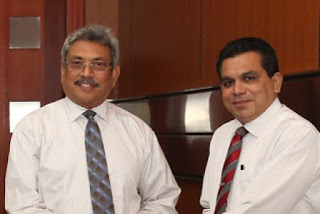 The Commission to Investigate Allegations of Bribery or Corruption yesterday moved the Colombo Chief Magistrate’s Court against former Defence Secretary Gotabhaya Rajapaksa and seven others for illegal authorisation of Avant Garde Maritime Services run floating armouries. A senior spokesperson for the Commission said that Avant Garde Maritime Services had earned Rs. 11.4 billion from the floating armoury operation. The other seven persons include former Additional Secretary of the State Ministry of Defence Damayanthi Jayaratne, Major General (retd) Palitha Fernando, Major General (retd) K.B. Egodawela, retired Navy Commanders Admiral Somathilake Dissanayake, Admiral Jayanath Colombage, Admiral Jayantha Perera and Avant Garde Chairman Major (retd) Nissanka Senadhipathi. The case will be called in the Mgistrate Court today to issue summons.